News of this discovery was not aired by the Associated Press, The New York Times, the BBC, CNN, or other major news services. These news agencies boast of a bevy of well-trained medical journalists who best serve the interests of the pharmaceutical industry. Nor will your doctor know anything about it. If you rely on these sources of health misinformation, don’t bother reading any further. It is a non-prescription cure for Alzheimer’s disease. Don’t wait for any of the 105 anti-Alzheimer’s drugs now in the development pipeline undergoing various drug trials in the approval process. For many Americans, these drugs will never materialize in their lifetime. It takes ~13 years for a candidate drug to move from the laboratory to FDA approval. By then you may not be able to remember you read this report. Alzheimer’s disease (AD) is both a social challenge and a personal tragedy. AD costs $200+ billion a year now to treat (with ineffective drugs, mind you) and projected to grow to a staggering $1 trillion in drug sales by 2050, which is more than the current Medicare budget. Not to worry about any zombie apocalypse. When the mindless population grows to the point where the remaining population has to be engaged in caring for the demented is when Soylent Green becomes reality, when food shortages are addressed by processing zombied humans into food (Soylent Green is people ground up into boxed flakes. The label says “soy and lentil-based nutrition”). You might want to replay a DVD of the 1973 movie by the same title. Nobody is talking cure once mental decline has set in. Pharmacologists are aiming at a 5-year delay in the onset of the disease to prevent 50% of the cases, which means the entire adult population has to be placed on drugs to cut the AD rate in half. There are only 5 prevention trials underway that would lead to anti-AD drugs being prescribed en mass to head off what now appears to be a looming health catastrophe. Many of the anti-AD drugs undergoing clinical trials are intended to allay symptoms, not cure the disease. Some of the current anti-AD drugs shorten one’s life expectancy. Nothing like culling the AD population to put a curb on unprecedented health care expenses. And what if all of the 105 drugs under development for AD are on the wrong track? Almost three quarters of the drugs (74) address beta amyloid, which you will learn below is not the cause of AD memory loss. Modern medicine is treating AD as if it were a drug deficiency? But what if AD is caused by a nutrient deficiency induced by high sugar/carbohydrate diets that are prevalent in the population? Why have I gone to such lengths to tell readers all this before I break the big news to them? Because most Americans demand confirmation by what they believe are trusted, unbiased and authoritative third parties. Nothing less than Mayo Clinic will do for many Americans. Why is a cure for Alzheimer’s disease being uncovered here by such an obscure source? If you have to ask that question you may also have been buffaloed into believing statin cholesterol-lowering drugs prevent mortal heart attacks, vaccines are the only way to prevent communicable infectious diseases, calcium pills prevent osteoporotic bone loss, and anti-depressants are your best friend. What kind of evidence would convince you a cure for Alzheimer’s disease has been discovered (yes, it even reverses the disease in process). Would you believe a PET (positron emission tomography) scan image that shows how much of the brain is actually working? Keep reading. This writer has previously written extensively on the role of vitamin B1 (thiamin) in the development of Alzheimer’s memory loss. A follow-up report points to a misdirected/self-serving medical industry that stands in the way of implementing a known cure for Alzheimer’s disease. This is in the context of modern drugs that have been found to be of worthless value. Seemingly out of nowhere researchers in Asia jumped from the confines of the animal lab to applied human therapy. 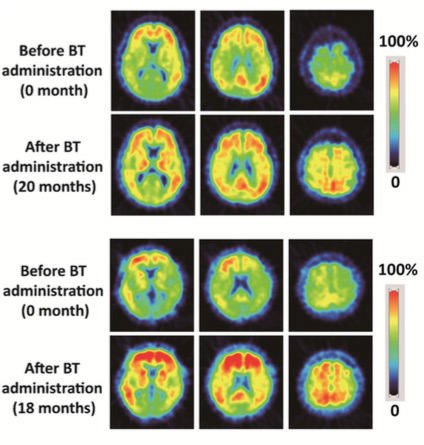 Five early-stage Alzheimer’s subjects were given 300 milligrams of daily vitamin B1 (Benfotiamine, a fat-soluble form of B1) for 18 months and then subjected to PET scans and mental function tests. The common form of vitamin B1 provided in multivitamins does not produce this beneficial effect. Mental function tests improved among these patients with early to mid-stage AD and brain scans reveal, on average, 36.7% of the brain was reactivated! This startling and compelling report, published in the journal Neuroscience Bulletin in December of 2016, drew no attention from the news media. Imagine these images on the front page of The New York Times and The Wall Street Journal. The value of 105 developmental drug companies and many other major pharmaceutical companies would plummet ion Wall Street in one day. It is no wonder Alzheimer’s disease poses a challenge to a carbohydrate craving society. Carbohydrates automatically increase the need for vitamin B1. This is why Dr. Derrick Lonsdale, the reigning vitamin B1 expert, says we live in a modern era of high calorie malnutrition. An even more effective form of B1 may be allithiamine that is known to cross the blood-brain barrier. Allithiamine is naturally found in small amounts in garlic cloves and is also available as a dietary supplement. The long-living masses in developed countries would be better served if this essential nutrient were incorporated into a multivitamin. To that end, this writer has formulated a multivitamin with both Benfotiamine and allithiamine. You don’t need 300 milligrams of thiamin used in the above referenced study to produce a biological effect. The body only absorbs 5 milligrams of B1 at a time. Researchers now say a vitamin B1 blood test can be employed to diagnose AD.